Quick question: What is the point of blending? The tried and true “wine geek” response would usually go off into one or two directions. You can talk about the history of Bordeaux (and other European wine regions) where planting a variety of grapes that bud and ripen at different points was a type of insurance policy against the pratfalls of nature that varies from vintage to vintage. The more poetic direction will talk of an artist painting a picture with each grape variety being a different color on their palette. Instead of just dealing with one color (one grape variety), the winemaker seeks to paint a more vividly engaging portrait of a wine with more colors at his or her disposal. Now let me ask you: What is a “Bordeaux blend”? If you’re quick with Google and quicker with a cork screw then you are probably mentally rattling off in your head a list of red and white grape varieties that are typically used to make wine in Bordeaux. It’s right but it’s also wrong. 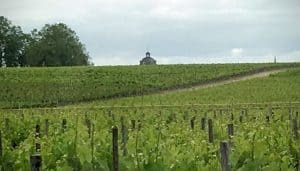 One of my most eye-opening experience during my travels to Bordeaux was the realization of how far-reaching the concept of blending is in Bordeaux. It is so much more than just blending grape varieties. Let me give you the example of Chateau Haut-Bages-Liberal, a 5th growth estate in Pauillac. On the 30 hectares of the estate scattered around the villages of Bages and Pauillac, they grow just two grape varieties–Cabernet Sauvignon and Merlot. So the blend each year should be pretty simple right? Grab a few beakers and graduated cylinders and see which ratio of Cab to Merlot works the best. You see much like the Burgundians, the Bordelais invest deeply into knowing each individual plot of soil–it’s strengths, weakness and quirks. This is knowledge that is acquired over decades, if not hundreds of years. For an estate like Ch. Haut-Bages-Liberal that has been around since the mid 18th century, this accumulation of knowledge and experience has led them to subdivide their vineyards into 42 different plots. While we are on a steep learning curve here in New World wine regions like Washington and California, we have gotten to the point where we are also seeing different personalities emerge from different blocks. When identified, these blocks may be farmed and harvested differently than the rest of the vineyard. On wine labels, we see heralded blocks like Sheridan’s Block One Cabernet, Schweiger Vineyards’ Legacy Block, Rochioli West Block Pinot noir, etc. At the Saint Emilion Grand Cru Classe estate of Fleur-Cardinale, they give each plot a name that captures the “personality” of that plot. But at most estates in Bordeaux, each and every one of those plots are treated as a “heralded block” and given its own unique attention. They will be fermented separately. Some in cement. Some in stainless steel. Some in big oak vats. Some in small oak barrels. Some plots will be split into a couple different types of vessels. In several estates I visited, I was taken back at how many custom made cement tanks I saw with odd (but precise) volume sizes like 21.6 hL, 23.9 hL, 58.2 hL, 61.9 hL, etc. It eventually dawned on me that each of these tanks were designed and made for a specific plot. The plots are still kept separate even after fermentation when they are transferred to barrel with most estates using the product of 4 to 9 different coopers. Each barrel adds it own “coloring” to the palate–some add more creaminess, some add more spice, others heighten the attack of the wine up front while another barrel may push it more to the mid palate. 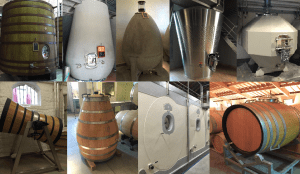 An assortment of the unique fermentation vessels used at various Bordeaux estates. All this means is that when the time comes to make the final blend of the Grand Vin (and subsequent second and even 3rd wine) the winemaker is not dealing with a color palette of just “the five grapes of the Bordeaux blend” but rather a palette with a kaleidoscope of color from as many as a hundred (or more) different lots that have each taken their own unique path from vineyard to the bottle. It is an art form in the most literal sense. While there are many outstanding New World producers of “Bordeaux-style” blends, I really have not come across a producer who takes the concept of blending to quite the degree of the Bordelais. It is so much more than just blending grape varieties. It truly is about expanding the palette to include not only more colors but more shades of those different colors. It’s all part of the tricks of the trade that have seen the Bordelais dazzle the palates of wine drinkers for centuries. 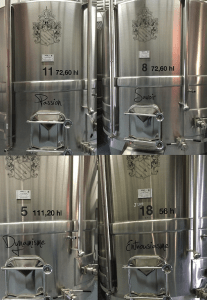 Tagged Bordeaux blend, Fleur-Cardinale, Haut-Bages-Liberal, Red blend, Wine making. 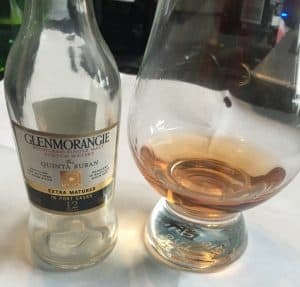 Author’s note: For an updated tasting that featured 13 whiskey/rum barrel aged wines check out the post Whiskey and Wine Revisited. As I’ve admitted before, I can be a bit skeptical about newfangled wine trends but I always try to keep an open mind. So when I walk into stores and see big displays of Gallo’s Apothic Inferno (“A Wine With a Whiskey Soul” they say) supported with advertising campaigns featuring tatted up and vested hipster bartenders playing with fire, I know I need to try some wines aged in bourbon and whiskey barrels. 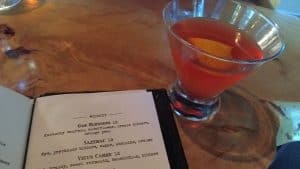 I love Woodford Reserve in my Old Fashioned, not necessarily in my wine. Henry H. Work’s 2014 book Wood, Whiskey and Wine gives a nice backstory on the love affair between wine and wood barrels that extend over two millenniums. He also goes into the sharing of barrel technology with other beverages like whiskeys and beers. I highly encourage folks interested in geeking out more about this topic to give it a look. In the 17th century, the convenience and availability of excess Sherry barrels from the bustling Jerez to London trade led to a “happy accident” of Scotch makers discovering the rich dark fruit flavors and deeper color that Oloroso Sherry barrels impart on whiskey aged in them. In recent decades, the concept of cask-finishing for whiskeys has expanded to include barrels that previously housed Port, Madeira, Sauternes, Amarone and even First Growth Bordeaux and premium Super Tuscan and Barolo producers. 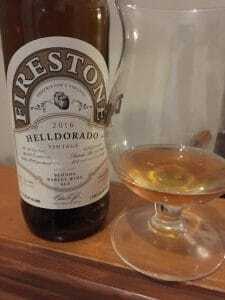 Perhaps taking a cue from the beer industry which has seen a huge explosion in popularity of barrel-aged beer, it may have been inevitable that we would see wine aged in whiskey barrels. The first mentioned of a whiskey barrel aged wine that I could find was back in 2010 when a winemaker in Australia some how got his hands on Pappy Van Winkle Barrels to age his 2008 McLaren Vale Shiraz. What became of his Southern Belle Shiraz, or if you can still find it, I don’t know as there are scant tasting notes on the web. I do find it interesting that the 2010 article from Garden and Gun noted that the expected release price for the 2008 was $25 USD but the average price of the three vintages available on Wine-Searcher (2009, 2011 & 2013) is only $9. If any one has further details about this wine (or know of an earlier whiskey barrel-aged wine), let me know in the comments below. As with most things in the wine industry, people usually don’t start paying attention to a trend until the big-money players get involved and that is what happened in 2016 when Pernod-Ricard (Jacob’s Creek), Constellation Brands (Robert Mondavi), Concha y Toro (Fetzer) and E. & J. Gallo (Apothic) released their whiskey barrel-aged wines. Are these wines any good? I was able to get my hands on 3 brands of whiskey barrel-aged wines–Robert Mondavi Bourbon Barrel Aged Cabernet Sauvignon, Barrelhouse Bourbon Red (made by Bruce and Kim Cunningham of AW Direct) and Apothic Inferno (aged in whiskey instead of Bourbon barrels). Tasting these wines with colleagues in the retail wine industry, I wanted to be as objective as possible so we decided to do this tasting blind and with a “ringer” of a popular dark red blend (which was the most recent hot trend in the industry till the whiskey-aged wines came barreling in). In this case, I chose Cloud Break Black Cloud from O’Neil Vintners. Wine A- Sweet smelling on the nose. Very ruby port-like nose with figs and dark fruit. Some vanilla. On the palate, rich fruit, very smooth but with noticeable RS. Yep, definitely very port-like with more overt oak spice flavors on the palate. Medium acidity. Medium-minus tannins. My guess is that this is one of the bourbon barrels one. Drinkable, good for sweet(ish) red wine drinkers. Actually this may be an improvement over many of the “Dark” blends since the oak spice seems to add some complexity. Wine B-This smells like a whiskey. But whiskey that smells like burnt rubber. Noticeably sweet nose. Roasted marshmallows and burnt flambe cherries. It smells like someone took a shot of cheap lightly peated whiskey, mixed with a really pungent Pinotage and then added it to someone’s Seagram 7 and Coke. On the palate, Burnt rubber and roasted marshmallows. Medium-minus tannins and medium-minus acidity, maybe even low acidity. It’s no where near as sweet as I expected it to be based on the nose but I can’t tell if that is a positive or negative at this point. Wine C- Much more subdued nose, medium-minus intensity but that may just be a scale down effect compared to Bag B. I don’t really smell any oak at all, just some subtle red fruit–red berries, maybe a little red plums. On the palate, I can get some vanilla but it is still very mellow. Medium+plus acidity, actually has some good life to it. Definitely still red fruit. Medium tannins, very ripe and smooth. My gut is telling me that this is the regular red blend but I’m a bit confused with the fruit being much more red than dark, knowing in the back of my mind that the “ringer” is one of the Dark Red styles. Whatever this is, its fairly enjoyable and with the medium plus acidity, can actually see this being a decent drinker and food pairing option. Wine D- Medium nose. Still way more subdued than Bag B and less fragrant than Bag A. Much more overt vanilla on the nose. This has a bit of a “whiskeyness” to it but its not in your face. A little dark fruit but, again, subdued. On the palate, this has some great texture. Medium+ acidity. Medium + tannins but very velvety and great full body. By far the most impressive mouthfeel. This feels like a decent $15-17 Cab. The flavors are very Cab-like as well, being more black currant with a little tobacco spice. The finish lingers with the vanilla and I do almost feel like I can taste a bit of roasted corn. Not enough to be weird but at this point I’m wondering if my palate is shot. Bag A.) Cloud Break Black Cloud — (The Dark Red blend “ringer”) I was totally fooled on this. The ruby-port aspect had me thinking that THIS is what these Bourbon barrel-aged wines should taste like. Definitely a wine for the smooth, bold (but slightly sweet) red crowd. 3rd favorite of the group. Bag B.) Apothic Inferno – As you could probably infer from my notes, this was my least favorite wine of the bunch. It certainly had the most in your face “whiskeyness” but, in my opinion, that didn’t add up to a pleasurable drinking experience in the slightest. Personally, I would rather drink any of the other examples in the Apothic stable (the regular red, Apothic Dark, Apothic Crush, etc) than the Inferno. It’s just not my style of wine at all. Bag C.) Barrelhouse Bourbon Red – This pleasantly surprised me. It definitely wasn’t what I expected from this category. As I noted, I strongly thought this was just a regular red blend. Very solid and very drinkable. Probably the 2nd best of the whole bunch. 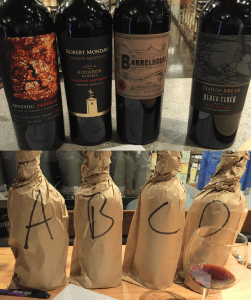 Bag D.) Robert Mondavi Bourbon Barrel Age Cabernet Sauvignon – the clear winner of the group and a very solid wine. I don’t think this wine needs the marketing gimmick of the “bourbon barrel age” (neither does the Barrelhouse really) and could easily stand on its own as regular, every day drinker that would do well paired with food or at a party with a crowd. Or we can just drink some cocktails instead. The Oak Blossom was delicious! So there you have it. It’s worth having an open mind and I would encourage all wine drinkers to give these wines a try and form their own opinions. Some of these wines, like the Robert Mondavi Cabernet Sauvignon and Barrelhouse Bourbon Red, are pretty solid and legit red wines. Others…..do have their own unique personality. I definitely recommend trying these wines side by side with either other whiskey barrel-aged wines or just general red blends. That is, by far, the best way to judge the character of these wines and see how they stake up against what you enjoy in red wine. Tagged Barrels, Red Blends, Scotch, Whiskey.